Last week, Google announced that it had reached an agreement to sell Motorola's handset division to Lenovo for $2.91 billion. As with last month's Nest acquisition, this led to a range of reactions from industry observers. Let's take a look at the rationale driving this deal. Let's begin with the financials. 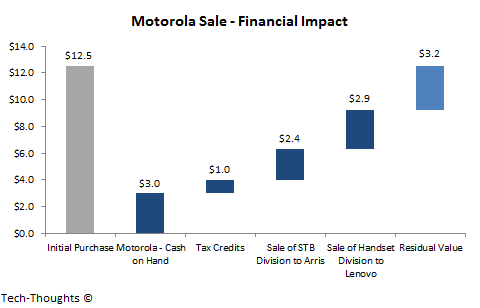 The chart above shows that excluding Motorola's cash, tax credits (which could be as high as $2.4 billion), the $2.35 billion gained from the sale of Motorola's set-top box division and the $2.91 billion sale of the handset division to Lenovo, Google "lost" a total of $3.2 billion in this deal. Of course, this $3.2 billion residual value needs to be attributed to the assets that Google retained, i.e. Motorola's patents (initially valued at $5.5 billion) and advanced research division. Of course, we also need to take into account Motorola's ~$2 billion in losses after the Google takeover and that the patents have not really paid off financially (and hence, may have been overvalued). 1. Remove any barriers between eyeballs and Google ads,2. Expand the footprint of ad inventory by offering new services beyond search, and, last but not least,3. Collect and mine maximum amounts of user data to improve targeting of their ads on both mobile and PC (where most ad revenues are still being made). Lenovo has been looking for ways to enter the US and European markets (and access carriers) for some time now and finally found a way to do it. Lenovo's motivations can be explained with a single word: Thinkpad. In the PC industry, Lenovo made waves by acquiring the Thinkpad brand from IBM. Their strategy was simple - combine low prices, numerous product configurations and the Thinkpad consumer brand to cater to the broadest possible market. This is the same strategy I expect them to follow with the Motorola brand. It is interesting to note that the timing for this deal couldn't be better. Recent pricing changes by US carriers have triggered a shift in the basis of competition in the smartphone market. As we've seen, the bottom of the premium market is beginning to shift away from from the iPhone/Galaxy range and towards more cost-effective devices. This is a trend that fits very well with Lenovo's strategy. Having said this, Lenovo is likely to face some challenges as it attempts to expand its presence in the US market. Motorola's product pipeline is likely to be quite sparse at the moment as Google's strategy was to focus on a limited range of devices. In comparison, Lenovo's strategy requires an expansive range of products at every configuration and price point. Therefore, Lenovo needs to either use their own product designs under Motorola's brand to begin with or use Motorola's design team to expand their portfolio over the next 12-18 months. Relying on Motorola's design team would give them the advantage of consistency in design language and product experience, but with longer-lead time (especially important as this seems to be the perfect time to execute Lenovo's strategy). Using Lenovo's product designs would accelerate the time frame, but would come with a trade-off in design consistency (which could be important to higher market tiers). Knowing Lenovo, I'd expect them to use the strategy that minimizes time to market and correct any flaws over the next year or two.